UPDATED: Tue., Feb. 5, 2019, 10:41 a.m.
ARE, Sweden – As Mikaela Shiffrin hopped atop the podium to celebrate another gold medal, Lindsey Vonn was nearby on the sidelines of the finish area, stretching her ailing knees and explaining just how she wound up entangled in a safety net halfway down the course. Definitive proof, not that it was really needed, of a passing of the baton in American – and world – ski racing. With a daring and often wild run, Shiffrin won the super-G by 0.02 seconds at the skiing world championships Tuesday for her first medal in a speed event at a major championship. She has now won a gold medal at four straight worlds. Coming in a season when she has been virtually unbeatable in the World Cup, she is unmistakably the queen of ski racing. For Vonn, it was an afternoon that made her question her decision to return for one last bid for a title before retirement. Racing straight after Shiffrin, Vonn was already 0.08 behind her compatriot at the first checkpoint when, off balance after misreading the roll on the crown of a hill, she straddled a gate mid-air, landed heavily on her right side, crashed her head against left arm, and went careening into the safety nets to the left of the course. There were audible gasps from the grandstand at the bottom of the course as fans watched on the big screen. Shiffrin looked away, seemingly in horror, and later said Vonn had been “on the edge of disaster.” Sofia Goggia, who won silver, clutched her helmet with both hands. Medical personnel tended to Vonn for a few minutes before the world’s most famous ski racer got to her feet, put on her skis, and went down the hill unaided. She looked groggy and in pain as she performed a slew of post-race interviews, but seemed better a few hours later. A positive sign was the way she spoke about still being a contender in the downhill on Sunday, in what will be the final race of her storied career. On a course that was shortened because of strong winds, Vonn was typically aggressive from the start despite the persistent pain in both of her knees that is forcing her into retirement. Shiffrin, a more technical racer, also took risks and that meant the victory wasn’t without its complications. She veered off line on the lower section of the course, flailed her arms mid-air to slow down and narrowly cleared the next gate, clipping it with her side. The mistake occurred right in front of U.S. head coach Paul Kristofic. “She flew far and slightly off to the left and had to make a fairly significant correction,” Kristofic told The Associated Press. Perhaps it explained Shiffrin’s reaction after seeing her time. She crouched over and held her hands to her face in disbelief. 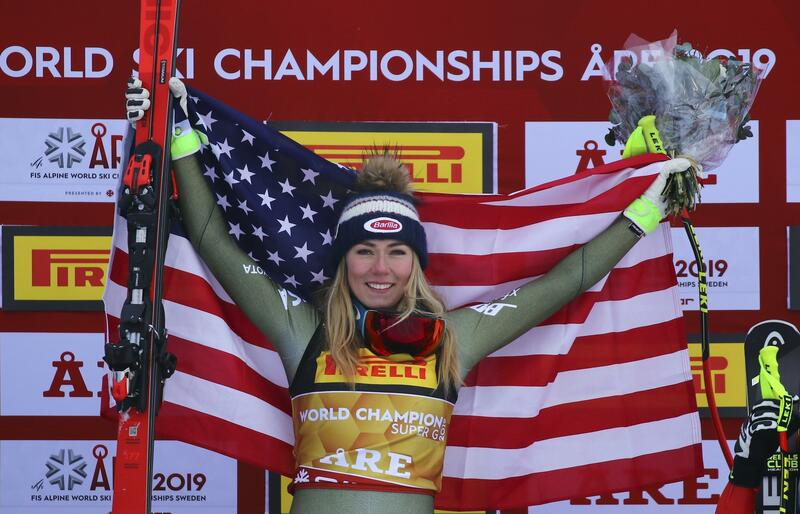 Shiffrin, a two-time Olympic champion, is now a four-time world champion and a five-time medalist at the worlds, to go with her 56 World Cup victories. That puts her 26 wins behind Vonn on the all-time list and 30 behind men’s record holder Ingemar Stenmark. Goggia, the Olympic downhill champion from Italy, managed a runner-up finish despite only recently beginning her season because of a right ankle injury. Corinne Suter of Switzerland was third, 0.05 behind – a remarkable result for a racer who nearly needed to have her right foot amputated last year after blood poisoning that almost went untreated when training at Stelvio, Italy. Published: Feb. 5, 2019, 9:05 a.m. Updated: Feb. 5, 2019, 10:41 a.m.